The ViewSonic LightStream™ PJD5353LS is designed with elegant style and audiovisual performance. A short throw lens with a 0.61 throw ratio offers large projection images for smaller rooms. This white projector makes a big statement with its elegant curves and light beam shape. Its thoughtful design, which includes a tactile keypad, instructional icons, and non-slip foot pads, also presents an intuitive and user-friendly interface. With SuperColor™ 6-Segment Color Wheel maximizes color saturation and brightness for true-to-life image projection. The LightStream Projector PJD5353LS is also powered by SonicExpert™ technology; the built-in speaker surpasses competing products in sound clarity and volume performance, as well as comfort. 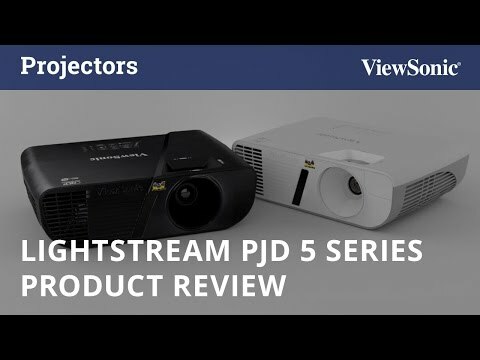 The LightStream Projector PJD5353LS boasts HDMI connectivity and native XGA resolution. It provides digital high definition devices, supporting media-rich business and education presentations. The HDMI delivers single-cable transmission of image and sound signals, for a more convenient installation process. The 3,200-lumen lamp with a 22,000:1 contrast ratio is for clearer and brighter images. From small to medium meeting rooms or classrooms, LightStream Projector PJD5353LS delivers quality images in brightness and colors. Supporting 2 x VGA, Composite Video, S-Video, 1 x VGA output, Audio in/out, Mini USB and RS232, this projector has flexible connectivity with analog-based equipment, providing compatibility with conventional analog-based applications without adapters or converters. DynamicEco® further reduces power consumption by up to 70% and extends the lamp life by up to 10,000 hours. Following a groundbreaking proprietary speaker transducer and chamber re-design, LightStream projectors deliver full-range sound 20Hz – 20KHz for presentations or off-the-clock home entertainment. The compact speaker takes pride in quality sound with best-fit Sound Response Curve, and high efficiency of transferring electric power to sound power. They sound stronger, offering more concentration, letting sound travel farther. The 2-watt Cube speaker is powerful enough to fill you meeting room with wall-to-wall sound – an improvement over the speakers of competing products in the same class.